An important issue I have faced already a couple of times in production servers was the usage of the Nonclustered Columnstore Indexes vs the usage of Clustered Columnstore Indexes. It seems that there is enough confusions about options and their availability, plus the global overview of the further development of the features might help you future planning of the upgrades. I have taken 4 currently available SQL Server versions (2012,2014,2016 & 2017) that support Columnstore Indexes and tried to describe and list the available scenarios and their support. Since Microsoft Azure SQL Database & Azure SQL DataWarehouse are prominently important members of the daily business for growing part of the IT, I am also including SOME informations on their support. – Data Warehouse (also Business Intelligence / Reporting Solution) – we load data into denormalised tables, during the defined periods and process massive amounts of information. SQL Server 2014 was a ground-breaking release which brought the support of the updatable Columnstore Index – the Clustered Columnstore Index, while the Nonclustered Columnstore Index remained non-updatable. One would jump on the conclusion that everything for the Data Warehouse scenario would be using the Clustered Columnstore Index only, but there are a couple of important exceptions/gotchas that need to be taken in account. The Disk-Based HTAP support became possible, because Nonclustered Columnstore Index finally became updatable, allowing to add/modify/delete rows in the table, as well as the any needed meta-data modifications for it. 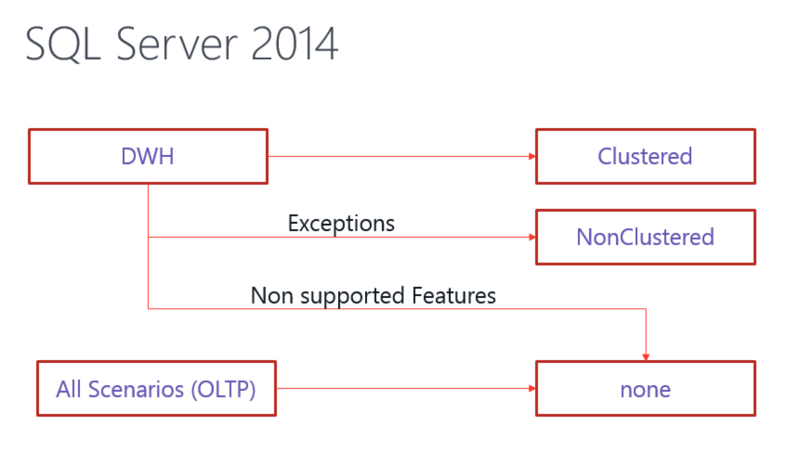 SQL Server 2017 has brought mostly bug-fixes and some important delightful features support for the existing architectures, such as LOBs support for the Clustered Columnstore Indexes, non-persisted Computed Columns for Clustered Columnstore Indexes or Online Rebuilds for the Nonclustered Columnstore Indexes. The most improvement were generic for all Columnstore Indexes, such as Adaptive Query Processing, allowing to adjust execution plan strategies during the execution, Trivial Plan elimination, etc. As for the Nonclustered Columnstore Indexes, they became more exciting by getting the Online Rebuild operations, narrow update strategies, but generally there were no ground-breaking changes. With the support of the LOBs and non-persisted computed columns for the Clustered Columnstore Indexes, the number of scenarios where a resolution would be the limited usage of the Clustered Columnstore Indexes has increased, but I won’t recommend it unless in absolutely exceptional case. Notice that I am not including some of the limitations, such as 8 bytes for the aggregate predicate pushdown, seeing them as more generic Batch Mode limitations, which should disappear eventually, and not preventing choosing Columnstore Indexes. Azure SQL Database is the same SQL Server 2017 we used to love, but it is being constantly updated/patched and by the time you are reading this article, it is possible that the engine is already containing some new bits from the SQL Server vNext. Currently you will need to use Premium Edition of the Azure SQL Database, but as Kevin Farlee mentioned at PASS Summit, there are considerations to bring the Columnstore Indexes over to the Standard Edition (S3), but the amount of the resources they consume is largely incompatible with any smaller editions currently. I do not hold my breath, even though for the development purposes it would be nice to have a small instance (S1 maybe) handling a couple of queries with Columnstore Indexes. Creation of non-clustered columnstore index is not supported in PDW. After all, we are talking about DWH – Data Warehouse scenario right ? You can see that with every single release the priority is changing and more scenarios and features are being supported. While I would love Microsoft to spend a couple of years making full parity for every type of the Columnstore Index and every scenario a par available Rowstore features as the very basis, I do realize that it is the newer features that attracts the clients and gets you press accolades and acclamations. I still keep the hope that the people responsible for the engine will find a fine balance between new shiny stuff, and things that clearly improve the productivity and allow easier migrations to SQL Server. In the mean time you can use this blog post as the guiding light.